What is 'Online Safety' ? It is the safe use of Internet and electronic communications technologies. Our SMART rules when using the internet. Take the quiz here to see how SMART you are online. 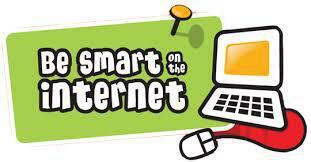 Learn more about the internet and being 'SMART' here. Parents and Guardians: Please spend time exploring these websites with your children. This link contains advice and information for children and young people. There are safe forums where you can discuss any worries that you have and a link to enable you to talk directly to a professional who can help you. Remember that you should also speak to any of the adults in school who are also able to help you. There are lots of great things to do in the Play section - you can play games, watch videos, try out the creative tools and get involved with ChildLine. Test your Internet safety knowledge with Hacker and help the Horrible Histories gang stay safe online. Try the Stay Safe eSafety Quiz !! Caught in the Web - is a Newsround special programme all about staying safe on the internet. The show, which is voiced by David Tennant, tells the story of a girl called Lonely Princess, who gets into danger after meeting someone in a chatroom. 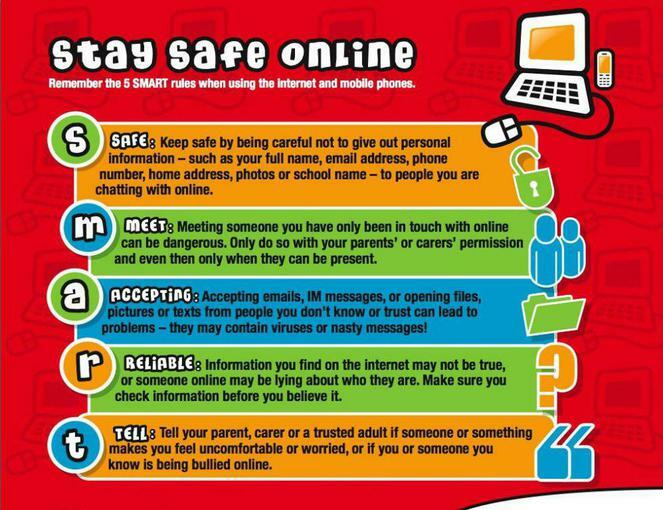 We help children stay safe online. Has someone acted inappropriately towards you online, or to a child or young person you know? It may be sexual chat, being asked to do something that makes you feel uncomfortable or someone being insistent on meeting up. You can report it to CEOP here. The Internet has become part of our everyday lives and is now easier to access then ever before. Use of the Internet can also have risks. Young people are more at risk of exposure to inappropriate or criminal behaviour if they are unaware of the dangers. The links below are for your information, but also to share with your children if you feel that they are appropriate. Designed to help educate parents / carers, teachers and young people about safe and positive use of the internet. 'Let's fight it together' Cyberbullying film. What we can all do to prevent cyberbullying. The Child Exploitation and Online Protection (CEOP) Centre delivers a multi-agency service dedicated to tackling the exploitation of children. How we protect the pupils accessing Social Networking sites such as Facebook, Social networking and personal publishing. The school will control access to social networking sites, and consider how to educate pupils in their safe use. Newsgroups will be blocked unless a specific use is approved. Pupils will be advised never to give out personal details of any kind which may identify them, their friends or their location. Pupils and parents will be advised that the use of social network spaces outside school brings a range of dangers for primary aged pupils. If you are under age 13, please do not attempt to register for Facebook or provide any personal information about yourself to us. If we learn that we have collected personal information from a child under age 13, we will delete that information as quickly as possible. If you believe that we might have any information from a child under age 13, please contact us through this help page.